Released on 20 March 2006 as a single or double DVD set. Length 98 minutes (disc 1) and 43 minutes (disc 2). 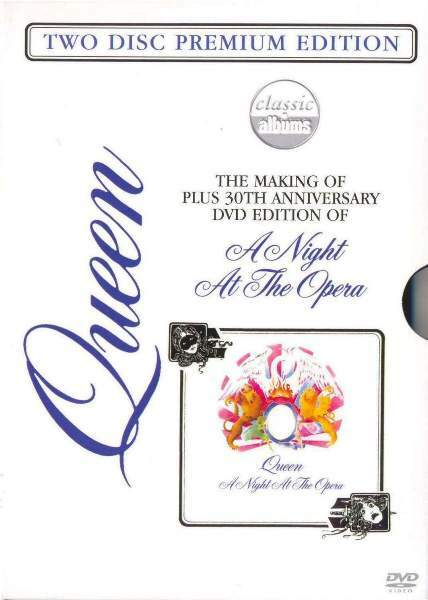 This is a DVD concentrating on the album 'A Night At The Opera', and features a 50 minute documentary featuring new interviews with Brian, Roger and Roy Thomas Baker, and adds a range of special features. The double disc version contains the same disc, but adds the disc from the 30th Anniversary CD & DVD set, and is housed in a card slipcase. From personal experience, in the UK at least, the single disc edition is much harder to get hold of. The main program was originally broadcast on BBC 2 on 18 December 2005, at 12:30am. The packaging featured a sticker on the front of the cellophane which advertised an acoustic performance of 'Good Company' by Brian May; unfortunately, whilst a short version appears on the disc, this is not a complete performance and the sticker should read 'Love Of My Life'. This page includes full details of the first DVD, which was produced by Eagle Rock Entertainment. The main program lasts for 49:19, and the disc adds 48:56 in additional bonus features, making a total running time of 98:15. The main menu features an excerpt of 'Bohemian Rhapsody', and contains options to play the main program, or jump to the Track by Track, Special Features or Subtitle menus. When the DVD first loads, the excerpt is played twice, then the main program is played. On subsequent visits to the main menu, the excerpt plays repeatedly. The 'Track By Track' menu features all twelve album tracks, spread over two menus (the two sides of the record), with an excerpt of 'You're My Best Friend'. Most of the tracks are the same as in the main program, but have been divided into separate titles. The two exceptions to this are 'The Prophet's Song' and 'God Save The Queen', which were not featured in the main program and which are both the same as in the 'Special Features' section. Finally, the subtitles screen allows you to select between German, English, Spanish, French, Italian, Dutch and Portuguese subtitles, or turn them off, and features an excerpt of '39'. Interview with Brian about singing the track live, an excerpt of him performing an acoustic version in the studio, and more photographs of Freddie. Title 14, length 2:50 (performance length 2:47). This is a new acoustic performance of the track by Brian. Title 16, length 5:48 (song length 3:45). This featurette begins with an interview with Brian about the origins of the track, the riff, playing it on the guitar to demonstrate, and the meaning of the track, and is then followed by Queen's performance of the track from Hyde Park 1976. Titles 17 and 22, length 11:35. This featurette appears twice on the disc, title 17 is played from the special features menu and title 22 is played from the track by track menu. Both titles are identical. Title 18, length 3:55 (performance length 3:53). This is a new acoustic performance of the track by Brian, which then cuts to footage of Brian and Freddie performing the track, taken from Live At Wembley 1986, before cutting back to Brian for the final verse. Titles 20 and 23, length 5:02. This featurette appears twice on the disc, title 20 is played from the special features menu and title 23 is played from the track by track menu. Both titles are identical. Interview with Brian in the studio, with demo version of the track played on the piano (0:57) with shots of the original track sheet, and further interview about the production techniques and the recording of the track.